(Financial Times) Scores of people were arrested in Ethiopia on Saturday in a wave of anti-government protests that rocked the capital Addis Ababa and dozens of other towns in the restless region of Oromia. Images posted on social media showed huge demonstrations in the capital and other cities. Activists said the protests could mark a possible turning point in the nine month campaign against the government. Fisseha Tekle, an Amnesty International researcher who is based in Kenya, said the police and the army were using live bullets to disperse the protesters. The demonstrations were sparked last November in protest against a move to extend the municipal boundaries of Addis Ababa into Oromia, which straddles much of the centre and south of the country and includes the capital. But they have grown in intensity in response to a fierce government crackdown. The Oromo make up about 40 per cent of Ethiopia’s 90m people but they believe they are marginalised by the Tigrayan ethnic group, which dominates federal institutions despite comprising only about 6 per cent of the population. In a report released in June, Human Rights Watch said that at least 400 people had been killed and thousands more injured since the protests began. However, Ethiopia’s communications minister Getachew Reda said that Saturday’s protests were “illegal” and that “scores” of people had been arrested in the restless region. Independent efforts to reach protesters in Ethiopia were unsuccessful. The Ethiopian government has severely restricted access to the internet and social media in the Oromia region, making it hard to verify reports of protests. But images showing bloodied bodies of protesters were circulated on social media using the hashtag #oromoprotests. 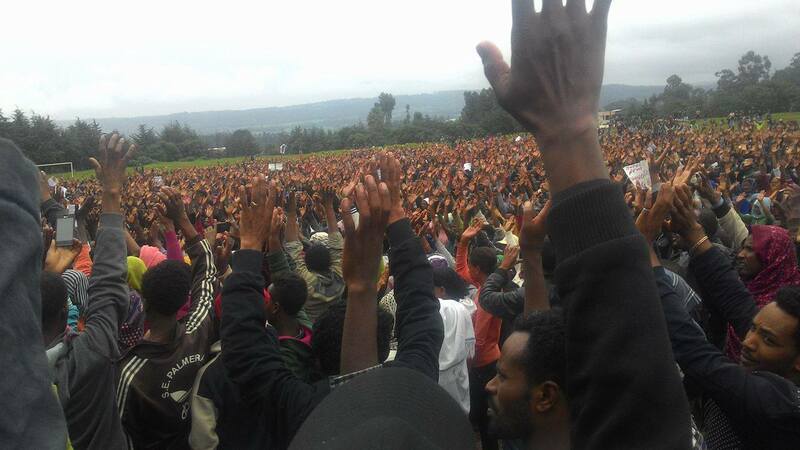 A mass demonstration was held in Gondar last Sunday, a city in the northern region of Amhara, to express solidarity with the Oromo and to express other grievances. It was the first time a major protest had broken out in another part of the country.